Women in Ontario have made significant progress in areas such as labour force participation and education. Yet, they continue to earn less than men. Women are overrepresented 1 in lower-paying occupations and industries, make up a disproportionate number of employees in minimum wage andpart-time positions, and remain underrepresented in many higher paying jobs and sectors that have traditionally been male-dominated. Closing Ontario’s gender wage gap has been made a priority by the Premier. 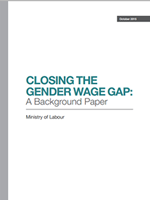 The responsibility for a Gender Wage Gap Strategy (the Strategy) has been given to the Minister of Labour, with support from Minister Responsible for Women’s Issues. It is increasingly recognized that the gender wage gap – the difference between the earnings of men and women – represents lost economic opportunities. the Nordic countries (where gender wage gaps are among the smallest in the developed world) will be reviewed. The information in this paper is not exhaustive. It is based on research and data readily available at the time of writing. Research into a variety of areas related to the gender wage gap is ongoing. Also view this paper online.